A rather good Stratacoustic review. 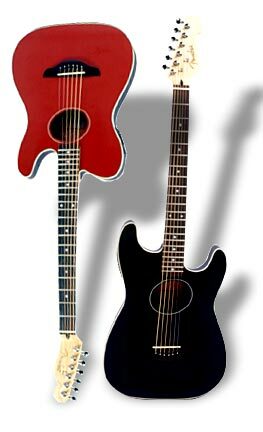 Fender Stratacoustic and Telecoustic guitars. A few weeks ago, I had the rare opportunity to see the Who in concert. While I spent most of the show simply basking in the glory of perennial favorites like I Cant Explain and Baba ORiley, the gear enthusiast in me could not help noticing that, even during acoustic passages such as the introduction to Pinball Wizard, Pete Townshend didnt bother to change guitars. Instead, he simply turned up the volume on the piezo pickup installed in the bridge of his Stratocaster and strummed away. While I was initially offended, I soon had to concede that in such a concert settingwhere miking an acoustic guitar would be impractical, to say the leastthe modified Strat sounded at least as good (or better) than many conventional, piezo-equipped acoustic guitars that Id heard in live situations. The truth of the matter is that when youre playing through a loud PA with an even louder band cranking behind you, the subtleties and nuances of acoustic sound are totally lost. Players would do well to forget about capturing that perfect sound and instead focus on whats really important: looking cool and rocking out. Thats where Fenders new Stratacoustic and Telecoustic acoustic/electric guitars come in. No, their bolt-on neck construction and shallow bodies dont produce the most well-rounded and splendiferous unplugged tones in the world. But take them onstage and plug em in, and youre certainly going to make a good impression. Based on the classic single-cutaway Telecaster and double-cutaway Stratocaster designs that have made Fender legendary, the Korean-made Stratacoustic and Telecoustic combine the vibe and flavor of traditional electric guitar shapes with forward-thinking construction that fuses the best elements of the plugged and unplugged worlds. Both guitars feature sturdy (and weatherproof) one-piece fiberglass backs, solid spruce tops, bolt-on maple necks with rosewood fingerboards, piezo pickups with active preamps, and die-cast, chrome-plated tuners. Judged by the criteria of traditional luthiery, this is a somewhat heretical way in which to fashion an acoustic guitar, but it is certainly an economical, easy-to-service and practical approach to guitar building. In fact, many of the electric guitarlike features of the Stratacoustic and Telecoustic are quite handy. For example, when these guitars emerged from their packing boxes after long, trans-Pacific journeys in the belly of an overstuffed cargo ship, each one required a quick twist of the truss rod to straighten out the neck. But because the trussrod access on these guitars is on the headstock rather than inside the soundhole (as it is on many acoustics), the adjustment was a snap and didnt require fumbling around inside the body. Once the necks were straightened out, the guitars were extremely playable, and the bolt-on neck construction provided upper-register access that surpassed that of many more-traditional acoustics. Played acoustically, the Stratacoustic and Telecoustic sound extremely similar and, for instruments of their diminutive stature, extremely good. Granted, the two-inchdeep bodies dont provide a lot of space in which complex overtones can be generated, but the guitars have a pleasing top end and tight (if slightly anemic) bass, as well as a honky midrange somewhat reminiscent of an old resonator guitar. Granted, this brash, barrelhouse tone wont send a flattop connoisseur reaching for his wallet, but for playing the blues on the beach or fingerpicking on the front porch, these robust axes are perfect. Plugged in (and this returns me to my initial point), these two guitars sound as good as any acoustic-electrics in their price range. Yes, the piezo pickup sounds a little plinky and percussive (as they all do), but the active four-band eq (treble, middle, bass and contour) built into each guitars upper bout allowed for gobs of tone shaping (a must if youll be plugging your acoustic ax into different PA systems every night), and the relatively small area of the Telecoustic and Stratacoustics flat tops make the two guitars extremely resistant to feedback. Good looks and good value make these two models perfect for stage use and road abuse alike.